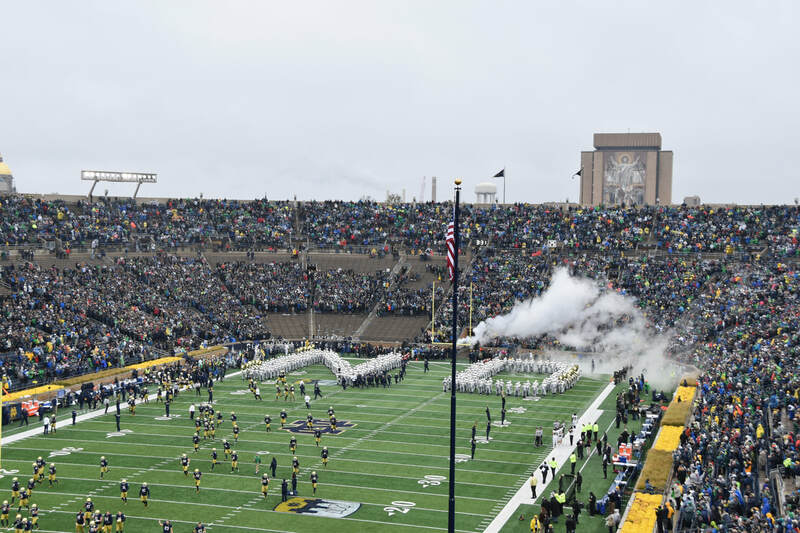 My perspective on Norte Dame completely changed after I visited the university for a football game between the Fighting Irish and the Wake Forest Demon Deacons in November 2017. I've never liked Notre Dame. I've always felt that they received undeserved hype, higher than justified rankings, and a legacy based prestige status that ignores the past years worth of flameouts. The school always seems to receive the benefit of the doubt. It's the only football program with an individual TV contract. NBC gladly pays Notre Dame for its football game rights so there's no need for to follow Texas' route and start its own network, a la the Long Horn Network. Whenever there is a head coach opening at the school, and there has been a lot of openings over the past fifteen years, the pundits talk about how it's one of the greatest jobs in sports. Every year fans expect the team to contend for a National Title. I've always wondered why? Why do this fans expect so much? Why do they think their team is so much better than ever other schools and deserves its own network? 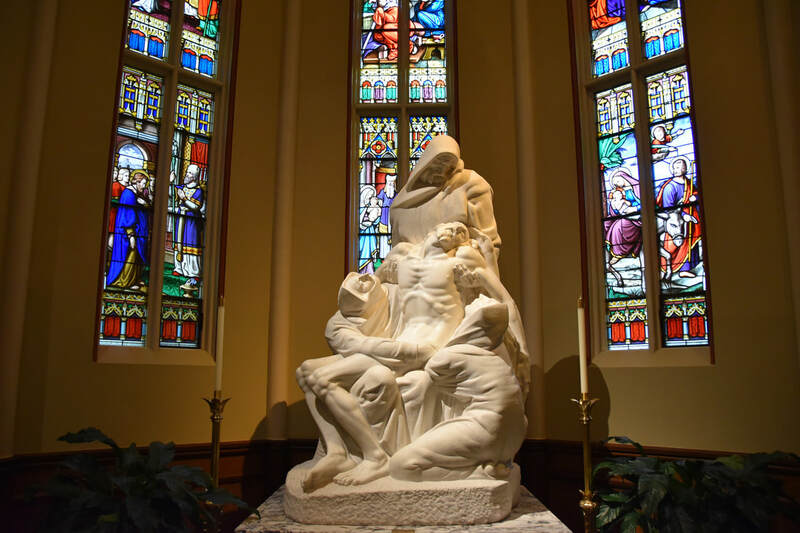 So there's a national appeal because of Notre Dame's status as the preeminent academic and athletic Catholic university in the US - I still don't understand why that means the rest of us need to be constantly lectured on Notre Dame's "greatness" and told to bow down and worship the school's history and tradition. ​Other schools have religious connotation. Other schools have churches on campus and are grounded in faith. Wake Forest's primary quad is flanked by Wait Chapel and Reynolda Hall, which in terms of architectural beauty compare favorable to Notre Dame's Main Admission Building (aka the Golden Dome) and the Basilica of the Sacred Heart (although the interiors of the Basilica is much, much, much more spectacular). Wake Forest has a baptist themed Demon Deacon as its mascot. The school still prevents taking classes on Tuesdays and Thursdays from 11 to noon because that was the traditional bible study period. Heck, Wake Forest even hired their school president, Nathan Hatch, from Notre Dame. But during my years at Wake Forest, I never felt like the school was anything more than a school. 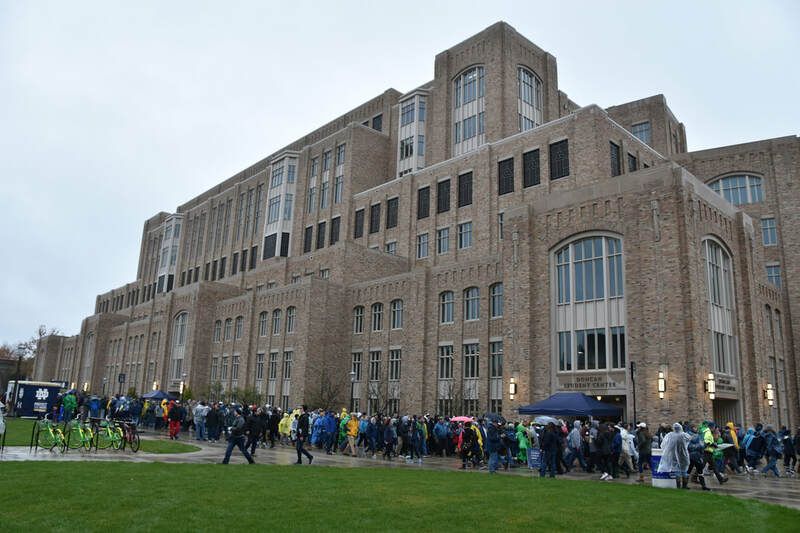 An afternoon, even a wet, windy, and cold afternoon, is enough to realize that Notre Dame is more than a school. 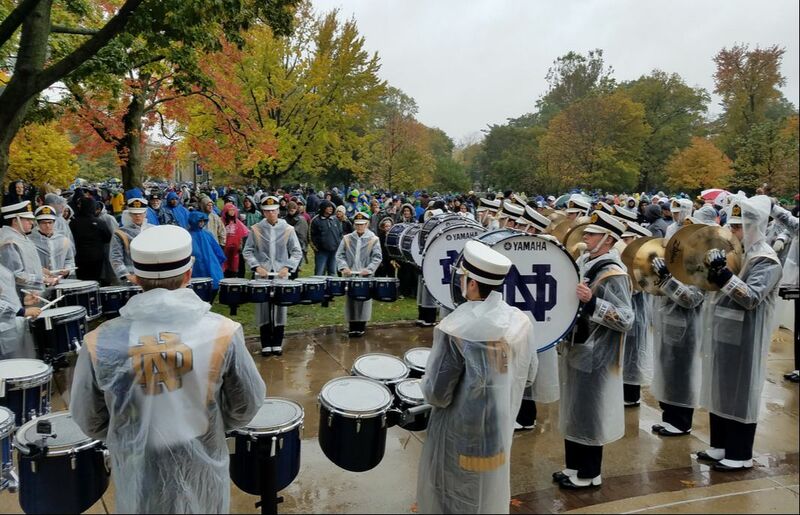 Nowhere is the "more than a school" more evident than in Notre Dame's football game day experience. Most schools measure their game day experience by the size of their tailgate - its measured in how many beers can be consumed prior to kickoff. 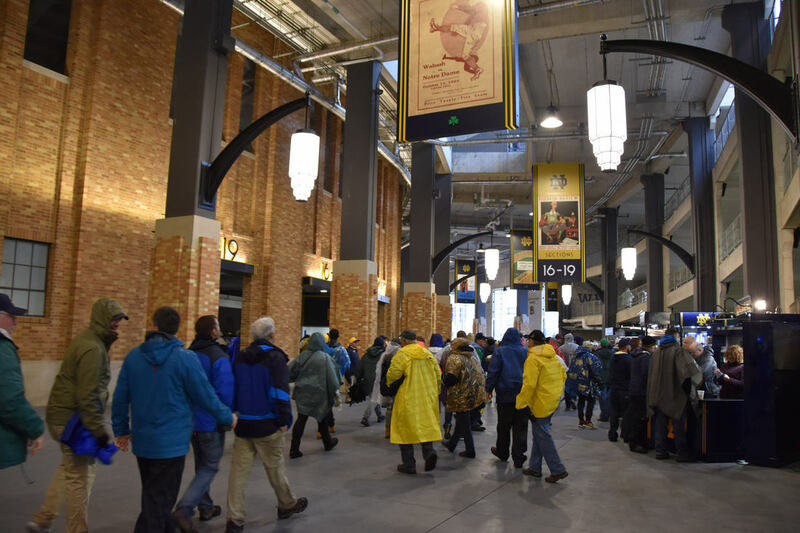 Notre Dame's is measured in experiences - which is not to say Notre Dame fans don't party hard before, during, and after the game, they do - it's that there's plenty of things for fans to do that don't involve parking lot keg stands. We arrived on campus around 10:30 for a 3:30 kickoff. The night before the school hosted various pep rallies and on Saturday a pregame show is filmed in the Joyce Center, the basketball arena, starting at 10. We did not attend either of those events. ​We parked at Burke Parking lot on the southwest side of the campus. From here it was a five minute walk to our first stop, Hammes Bookstore. Along the way a parking attendant distributed a game day guide listing all of the Notre Dame experiences in time order - a very useful handout. As far as bookstores go, there's no Hammes equivalent. The store had the largest variety of apparel and merchandise I've ever seen. Anything you could possibly think of had a Notre Dame logo on it. A Rudy jacket? Check. 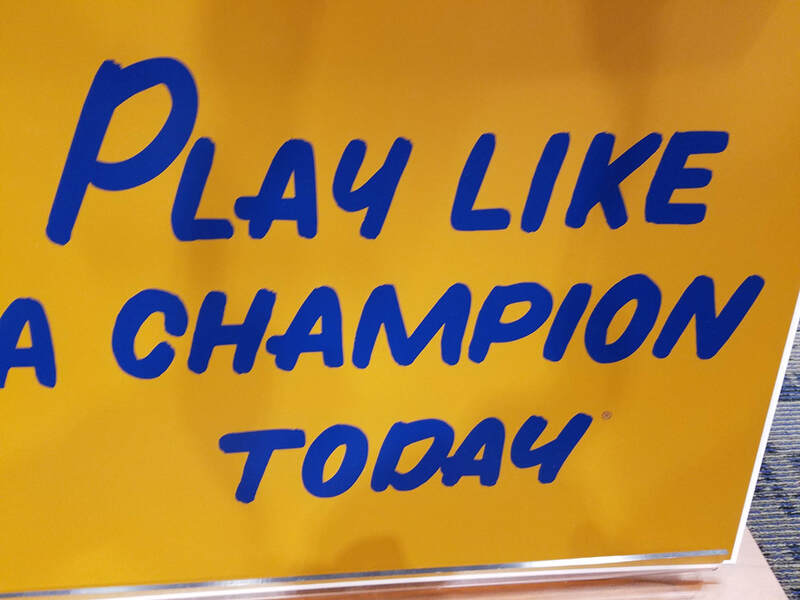 A "Play Like a Champion Today" replica plaque? Check. An Ara t-shirt? Of course. The place was a madhouse before the game. It's definitely quieter post game. 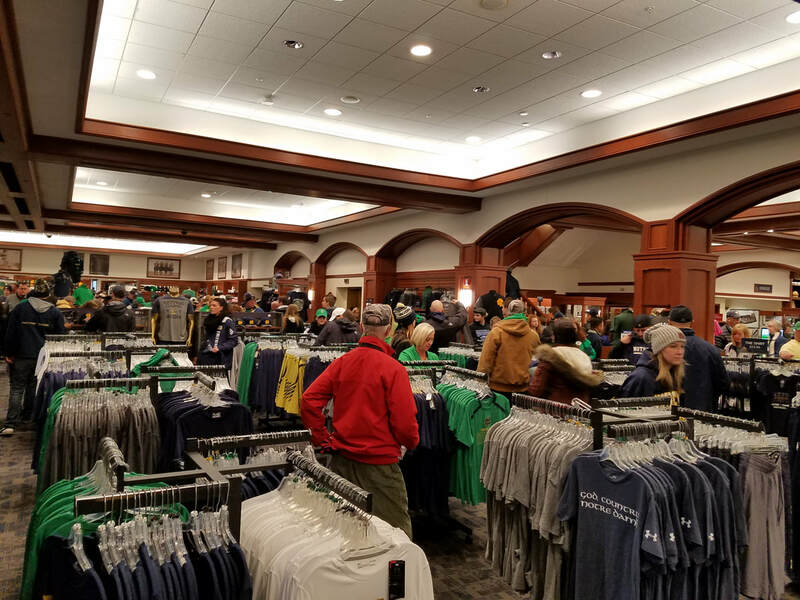 There's another Hammes Bookstore on Eddy Commons, however, it did not compare in scale to the on-campus Hammes Bookstore. 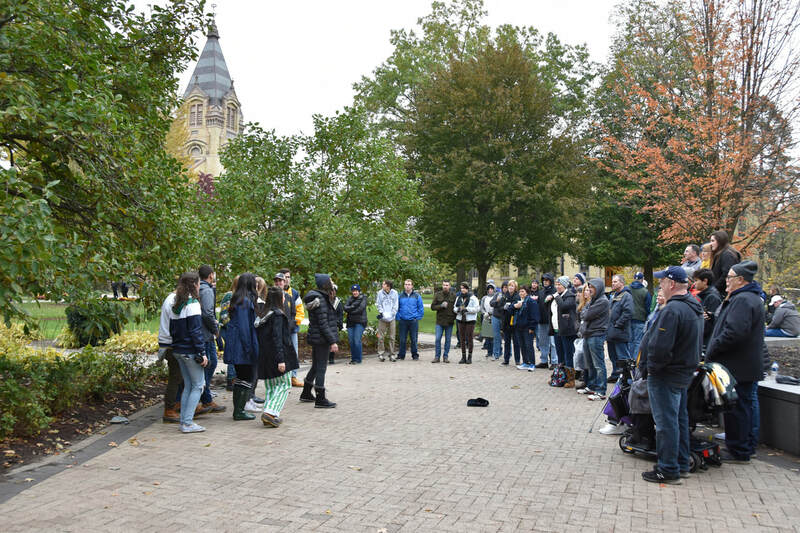 We walked though most of the campus on the way to our second stop, a bagpipe concert under the dome of Notre Dame's Office of Admissions. 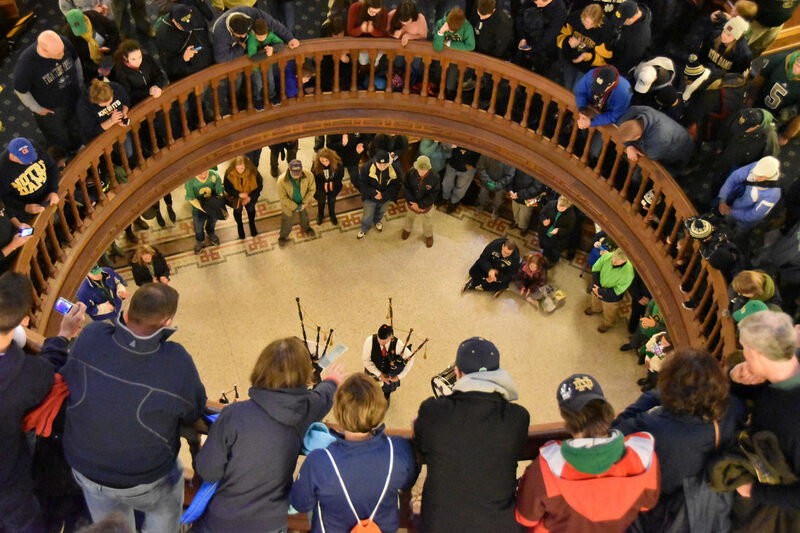 Notre Dame's bagpipe troupe performs on the second floor of the building and crowds gather early for a good seat. 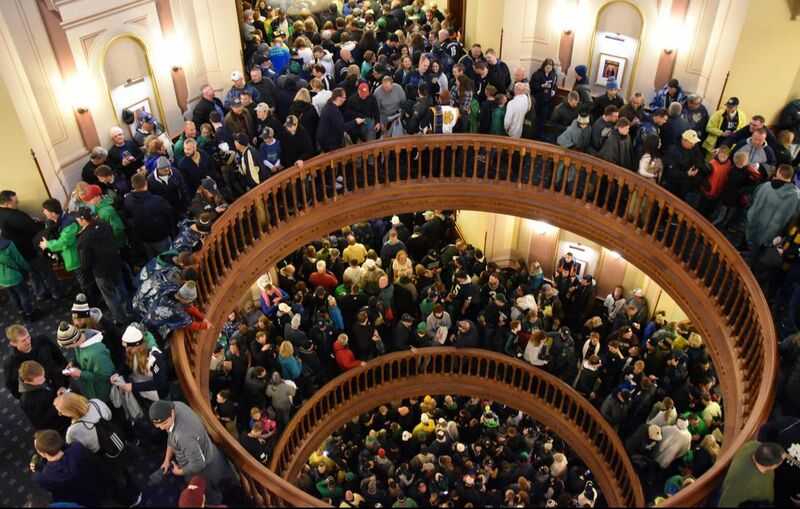 The second floor is open all the way up to the dome, thus crowds also gather around the third, fourth, and fifth floor balconies to look down on the bagpipe players below. The troupe plays for about fifteen minutes then poses for photos afterwards. 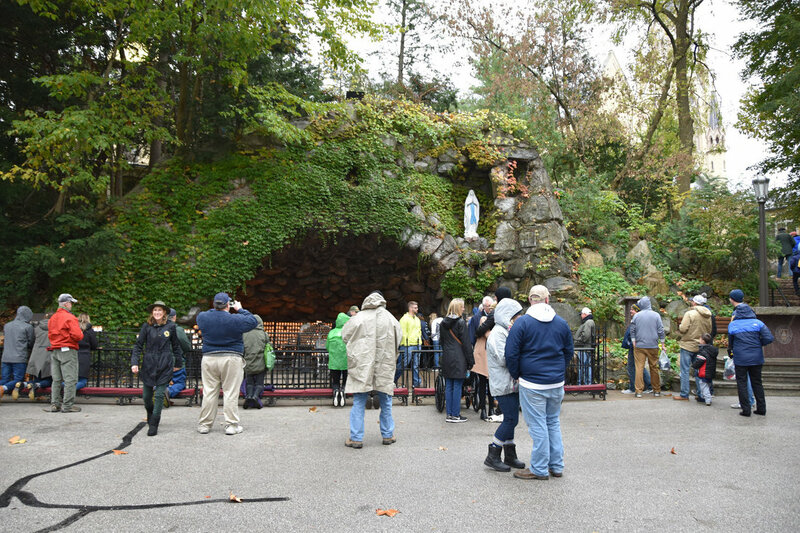 The Grotto, Notre Dame's most religious site is a short walk away. It's the first stop on game day for fans walking in from the White Parking Lot. You can light a candle and say a prayer. 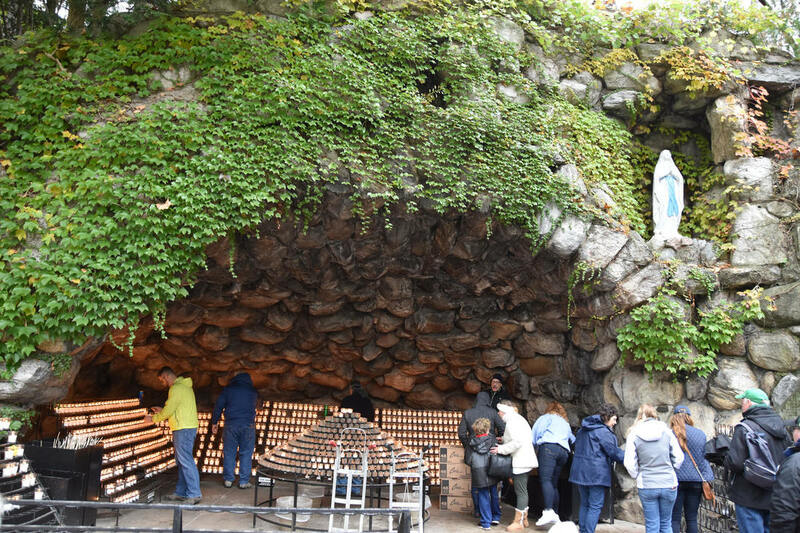 By kickoff the Grotto is completely filled with flickering candles. 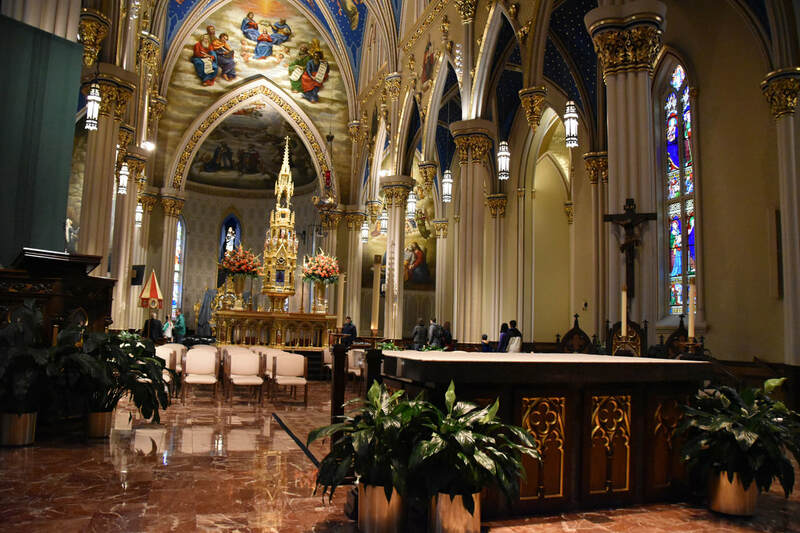 The next logical stop is a walkthrough the Basilica of the Sacred Heart. From the outside the Basilica looks kind of plain. From the inside - wow! There's beautiful paintings. There's an ornate gold reliquary shrine in the center of the church that looks like it came straight out of medieval times. We looped around the inner sanctum, then sat to enjoy the aura of the church. All of the campus dining halls are open to visitors. If you want to eat a game day breakfast in North Dining Hall, go ahead. 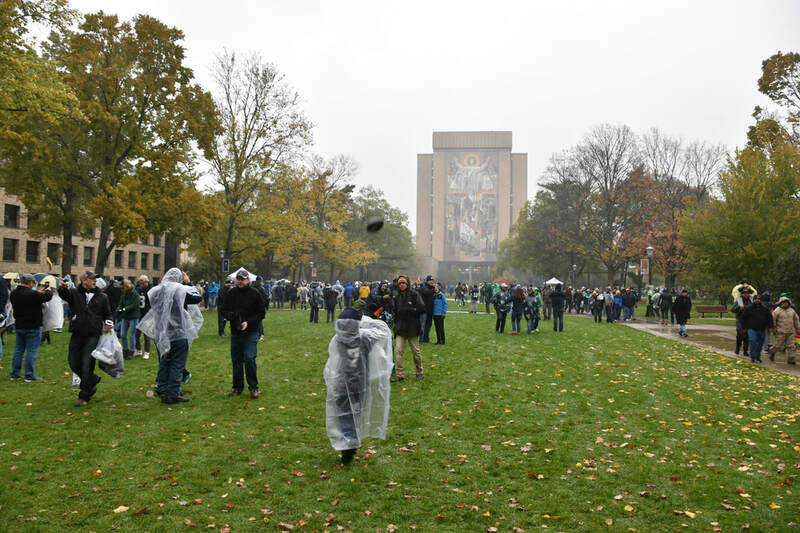 The more Notre Dame experience option would be to purchase a brat or hotdog from one of the charitable grilling tents scattered around campus. 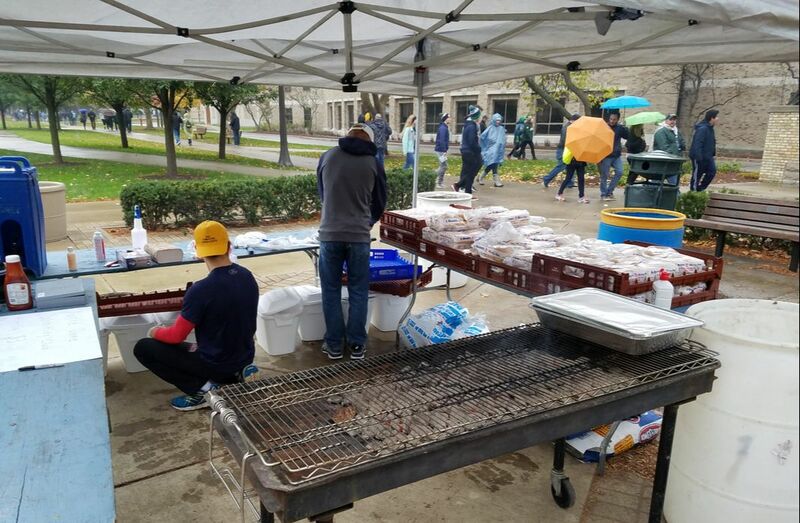 From the wrestling club to the book club, many of Notre Dame's student organizations sell tailgate style food to raise funds. You get the tailgating experience without the hassle of the charcoal grill. Throughout the day we heard the refrain "Here come the Irish!" shouted at the end of a bagpipe set and other pep speeches. 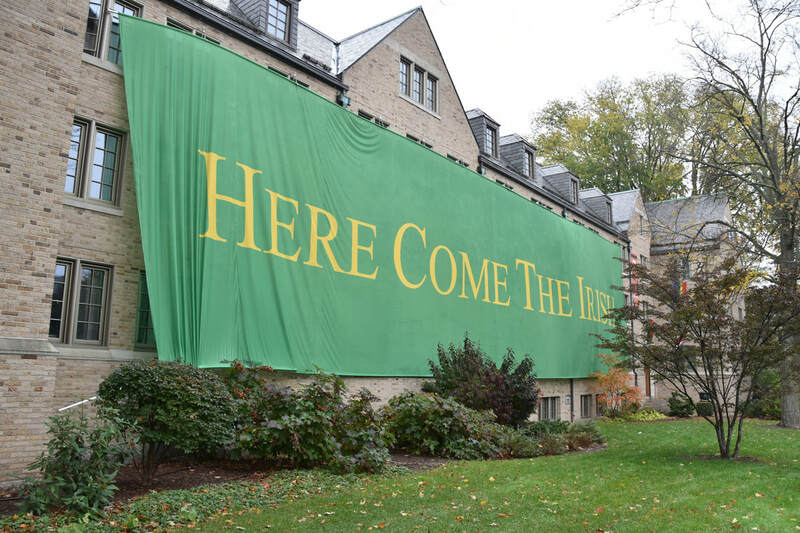 Zahm Hall takes the refrain one step further by draping a giant gold and green banner across its quad facing wall that proudly declares "Here come the Irish". It's a must stop on the way to North Dining Hall. We rested in North Dining Hall before making our way to Hesburgh Library. 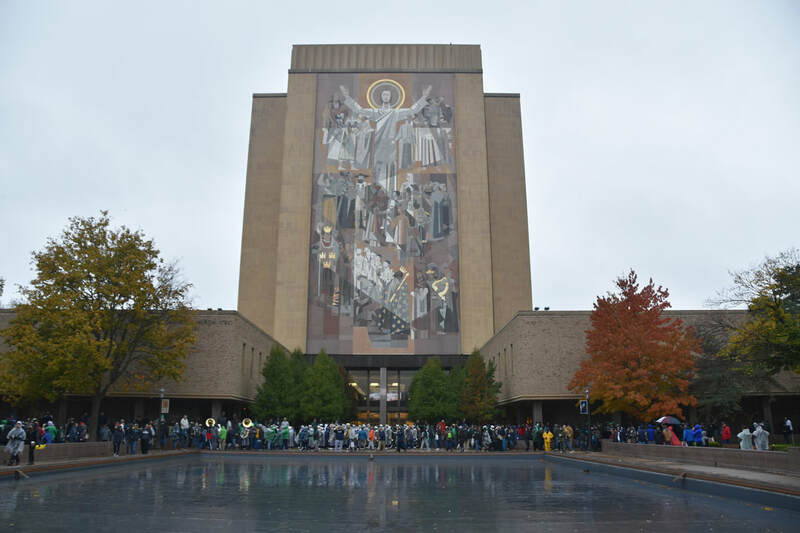 Hesburgh Library was a massive, seven story mural on its southern, stadium facing facade. 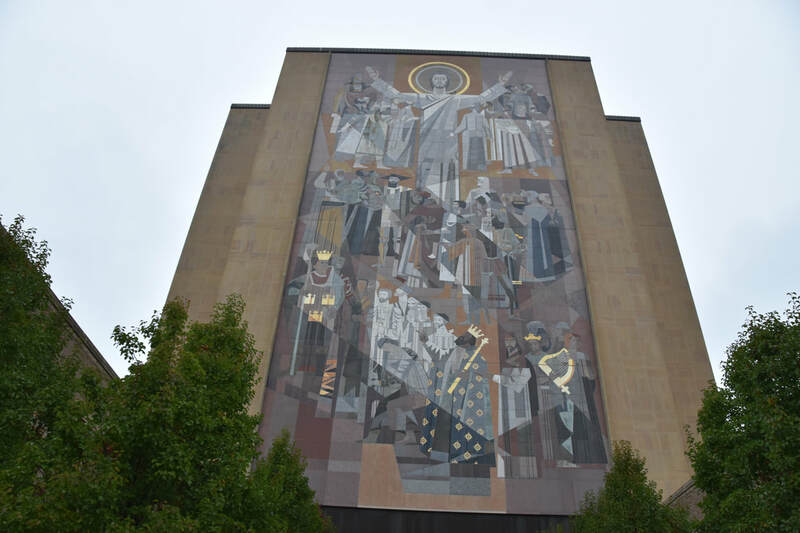 The mural is officially known as Word of Life, however, even a novice could look at Jesus with his outstretched arms and declare that's "Touchdown Jesus". 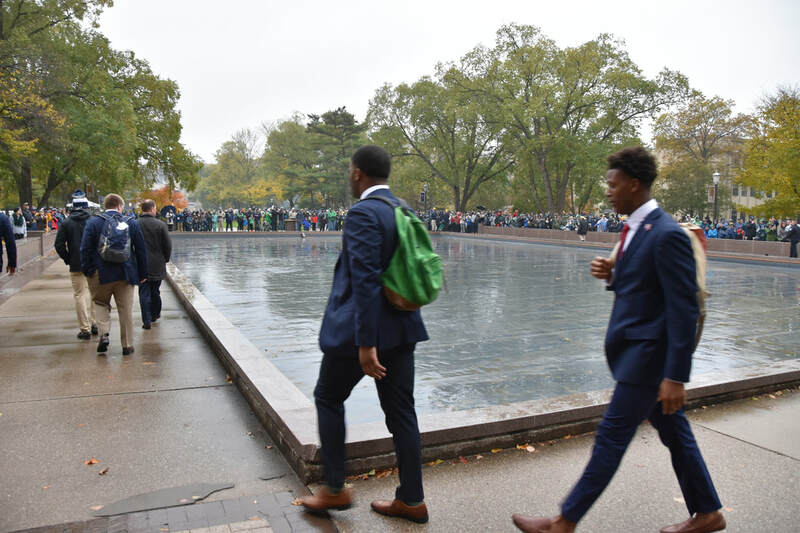 Around two hours before the game the Notre Dame players walk through campus, starting at Hesburgh Library, then head down a quad to the stadium. The players are dressed in navy blazers and appear focused for the game. The walk doesn't feel forced or contrived. It's a Notre Dame tradition. The fans follow the players down the quad to the stadium. ​The next hour or so was about the only time during the five hours we were on campus when there was a lull in pregame activities. We took a break in the Joyce Center which has a few cases with Notre Dame sport memorabilia. We then walked back to Hesburgh Library. I was impressed with the openness of the campus. As a visitor I could walk just about anywhere and it struck me that on game day, students are surrounded by non-students. It's a unique experience. Nowhere was that more evident than Hesburgh Library. Visitors took up much of the sitting areas. Students were trying to study but I'm not sure how successful they were at learning new information. Even the first floor reading room was filled with football fans. We walked back to the admissions building an hour before the game for the playing of trumpets which then leads to the marching band's promenade through campus. 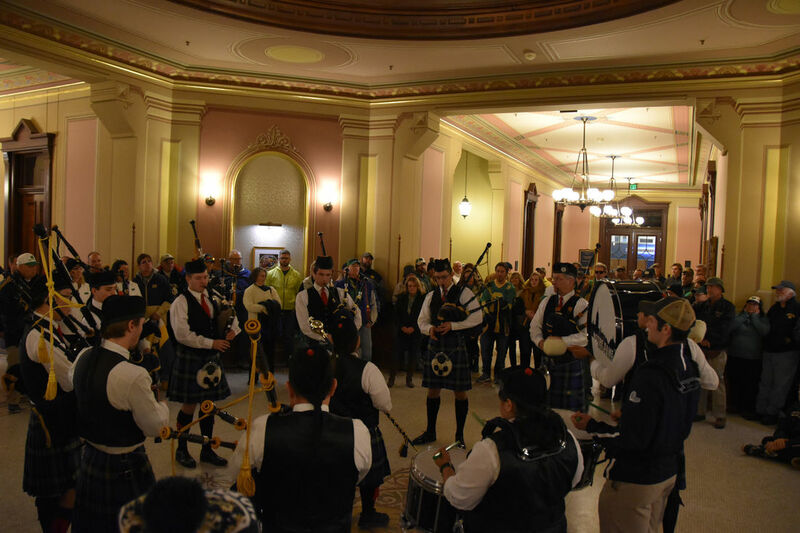 I thought the bagpipes under the dome was crowded, the trumpets under the down was even more insane. Fortunately we knew from our previous experience you can cut across the ground floor and up a back side stairwell to avoid crowds. The "secret" stairwell may not have been crowded but we still couldn't get anywhere close to the trumpets. Fortunately the trumpet sound blaring the Notre Dame fight song reverberated throughout the building. We headed outside and followed the rest of the band through campus to the stadium. We heard the Notre Dame fight song at least five times - rah, rah for Notre Dame! Unarguably the best college game day experience out there. ​On to the game. There was a slight let down with the stadium. From our seats in the southern end zone we could see Touchdown Jesus and the Golden Dome. There's not a bad seat in the house. 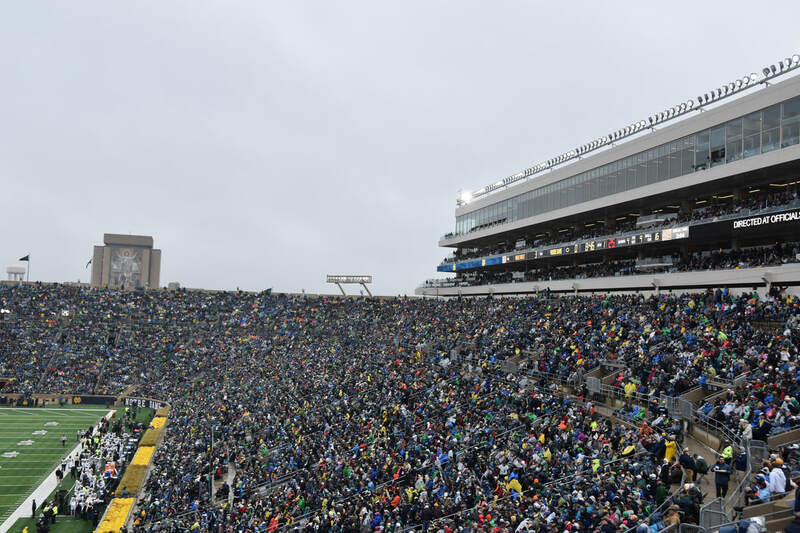 For as much tradition as Notre Dame has and for as many iconic games that have been played on the field, the stadium felt like any other major college football stadium. Perhaps it's my lack of in-depth knowledge of Notre Dame's football history that made me feel this way. Perhaps it was the rain and the forty degree weather - which also made the crowd a little quieter. Maybe it was because the stadium felt "newer" - the stadium underwent a modern facelift to increase capacity, however, the original shell was retained. If anything the stadium was too nice. That sounds crazy but most iconic and historical sporting venues are, for lack of a more sophisticated word, dumps. The only thing places like Wrigley Field, Fenway Park, and Cameron Indoor have going for them is they are really old - because, otherwise, they are just dumps. Notre Dame Stadium didn't have that dump feel. I'm sure some of that has to do with the school's prestige. Everything else on the campus is first class - it may have felt a bit out of sorts if after seeing everything else handled so well that you went to the stadium and it felt like you were stepping back into the 1910s. As for the game itself. Wake Forest: 3. Notre Dame: 0. If the the game ended at 8:46 left in the first quarter. Unfortunately there was another fifty-four minutes to be played. 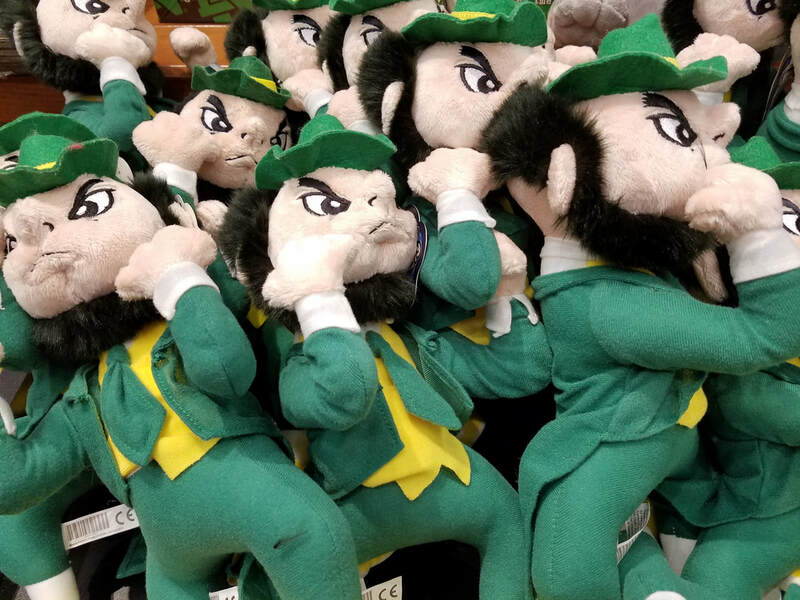 For Wake Forest to win against the 3rd ranked Fighting Irish they'd need to play a perfect game and have a few balls bounce in their direction. The Deacs made one mistake, an interception at their thirty yard line that was taken back to inside the five, and were unable to recover a Notre Dame first half fumble. They didn't play much defense, they rarely do, but they did score 37 points. If you told me before the game that the Deacs would score 37 points, I'd be ecstatic and assume they scored an upset. Notre Dame hadn't allowed more than 20 points in a game all season. Then I'd hear the Deacs gave up 48 points. Final score: Wake Forest: 37. Notre Dame: 48. A long way gone from 3-0. It was cold and rainy throughout the game, so with the halftime score at 31-10, my Dad and I made a break for it and headed to Eddy Commons. 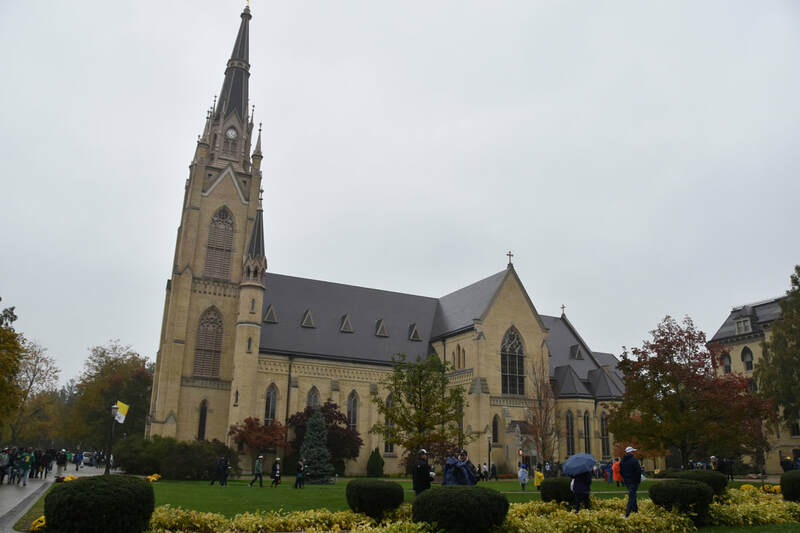 Notre Dame doesn't have much in the way of a "college" street - I think this is something all private universities suffer from - however, there has been an attempt to create an off-campus experience in South Bend. We watched the 3rd quarter from O'Rourke's while drinking an NYC priced Guinness. We then walked around the rest of Eddy Commons and returned to Hammes Backstore. 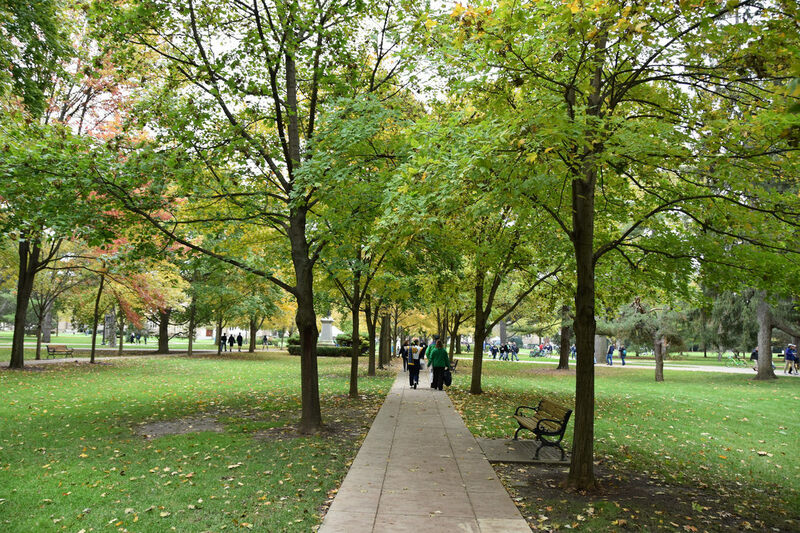 I wouldn't call Notre Dame a beautiful campus - that's not meant to be negative. It's a very nice campus. It's impressive. It's clean. Well manicured. But it's also basic. Some of this is preference - I prefer Wake Forest's Georgian architecture. Some of this is fact - the buildings are simply not as ornate or as historical as say Princeton. It doesn't have a great natural setting. 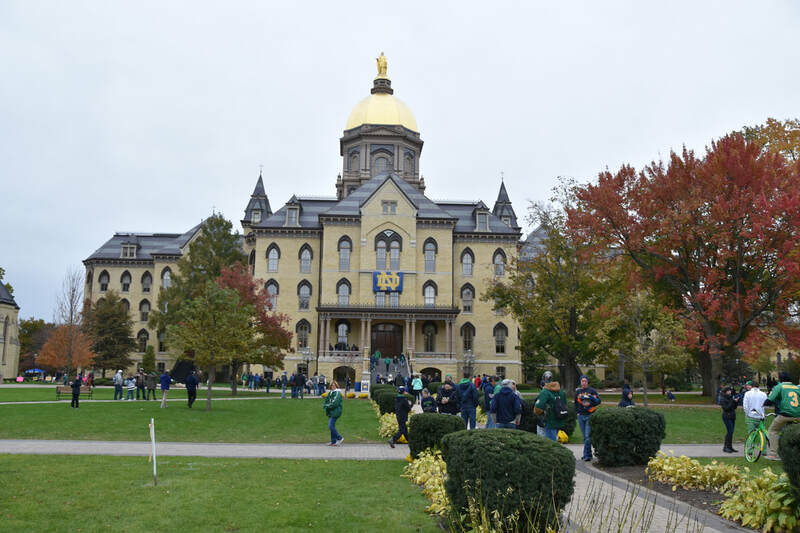 South Bend isn't a great college town - no one is mistaking it for a Chapel Hill or Ann Arbor. It's nice. It's modern. The dining halls and library have all been updated and look fantastic. It's all things except beautiful. I just can't call it that. The buildings are a boring shade of tan. The whole "South Bend isn't a college town" thing is evident in the dining options. While we enjoyed visiting the student dining areas and the on-campus game day grills, there weren't many options in South Bend. The school has attempted to address the situation with the creation of Eddy Commons, a dining, commercial, and residential complex, just south of the school. The Linebacker is a famous dive bar near campus, although on game days you'd be lucky just to get inside. South Bend's commercial district is a few miles southwest of the campus and has a few options but is otherwise nondescript. It looks like a worn down Midwestern town. Hotel and Airbnb options are more plentiful, although the come with a MAJOR caveat. On a gameday weekend they are very expensive. I saw Airbnb's for $200 that offered less than the typical $50 Airbnb. Morris Inn is an awesome hotel right on Notre Dame's campus. Even if you don't stay here it's worth passing through to check out the ambiance. We spent the night in Michigan City, about 45 minutes west.